Are you looking for the perfect pair of red earrings to match that wonderful dress you bought? Maybe you are trying to find the most perfect gift for that special someone for Valentine's Day? Whatever the case may be, these are exactly what you are looking for. These Garnet stones are a deep dark red that can be the most beautiful pieces of jewelry in the room. The beautiful gems are fitted into place with 14K White Gold plates. What could make these earrings even better? Being heart shaped! Hearts are elegant, and what every woman looks for when she is shopping for jewelry. These earrings are accommodated with post with friction backs, which are a wonderful asset to ensure your earrings, will not go missing sometime during the night. 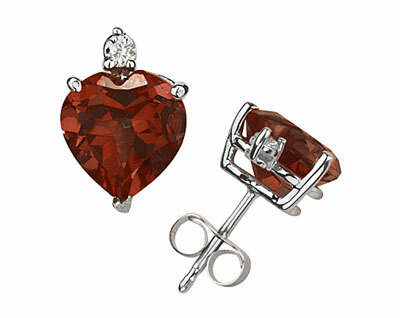 We guarantee our Heart-Cut Garnet and Diamond Stud Earrings, 14K White Gold to be high quality, authentic jewelry, as described above.